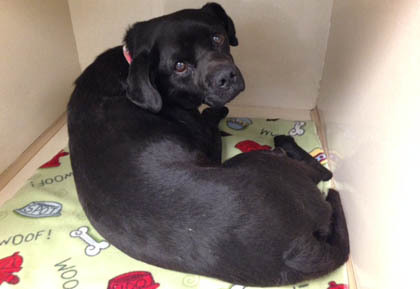 A black dog tossed from a moving vehicle, had compound femur fractures and a dislocation at the hip on a hind legs, but thanks to rescuers the pet is healing. 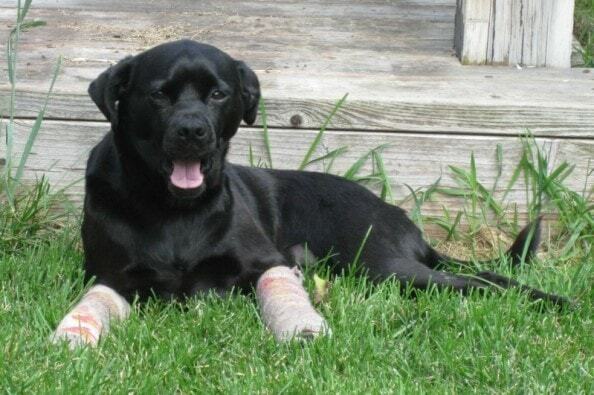 Maggie, a four-year old Puggle was found injured on the side of a rural road in Wyoming. No one knows how the black dog ended alone on the road, but rescuers knew she needed immediate help. It took a few hours and a lot of planning to help get Maggie off the road. Her rescuers were able to coax the dog to lay on a tarp they used as a stretcher, and moved her into the back of a car for transport to a vet clinic. At the clinic, Kruse learned the injured dog was probably tossed from a moving vehicle. Her hind leg had compound femur fractures and a dislocation at the hip. The dog’s front legs were injured too. Because of State laws, veterinarians had to place Maggie on hold for five days, this to give her owners a chance to come claim her. During those five days the injured dog only received pain medication and veterinarians advised Kruse that if no one claimed the dog at the end of the holding period, she should put the dog down. Kruse didn’t take the advice. When the five days were over, she picked up Maggie, took her home, and made arrangements for her to be seen by another vet. The new vet performed femoral head ostectomy on her hind leg and placed her front legs in casts to allow healing. Days passed and even though surgery was done, Maggie’s disposition didn’t change. She continued to be in pain and refused to move. A worried Kruse took the rescued dog to an orthopedic surgeon and learned the first surgery was done completely wrong. Maggie had a second surgery and the femur was re-plated successfully. 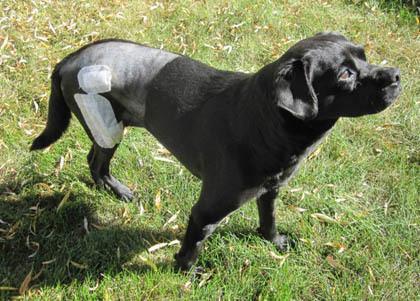 The surgeon is confident the former abandoned and injured dog will regain some function on her hind leg. As for Maggie’s front legs, they do have soft tissue damage and she will need a third surgery to help her regain mobility and be pain free. The black dog’s road to recovery is still a long one. She will need laser treatments and physical therapy to become a happy normal dog once again. Once she is all healed, Kruse hopes to find her a forever home of her own. God bless the ones that found this baby. God bless this sweet baby. Im so glad she was found shes such a cute girl!! I’m glad she’ll have a chance to have a REAL FAMILY WHO LOVE HER. And now to find who did this!!! Five days without medical treatment. What kind of state is Wyoming??? I am Maggie’s mom and want to give an update: even though I hadn’t planned on keeping Maggie, she ended up becoming a part of our family. After her initial two surgeries we decided to give her front legs a chance to heal on their own, and they have. Maggie’s muzzle has turned gray, but other than that she does not show her age (we believe she’s 8) and still does really well on 2 hour walks. Thank you, Katherine, for writing this article, and thank you all for your sweet comments and concern for Maggie, hug your dogs from us!